Was hoping this was more blue, but it isn't. However it is more purplish and that is my daughter's favorite color, so it worked out anyways! Her bed furniture is black and she wanted some color. This really shines in there! This dramatic panel print, inspired by intricately patterned oriental rugs, will become your personal magic carpet to peaceful dreams of faraway places. 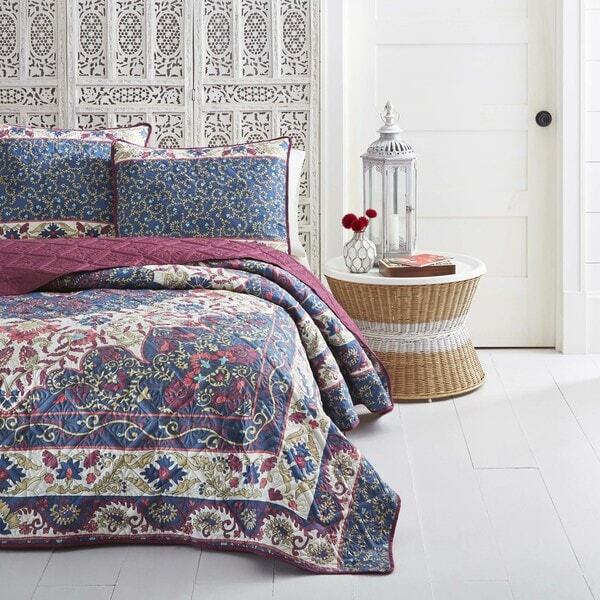 Envelop yourself in the rich patterns and colors of an Eastern bazaar with deep Cobalt blue, Cranberry red, and accents of Coral Spice and Turquoise on Ivory. The solid Cranberry quilt reverse is used to trim the edges of the quilt and shams and is also used for coordinating embroidered accent pillows to complete the global mood. An extremely decorative floral medallion quilt stitch adds a strong pattern element to the reverse and subtle texture and richness to the print face. Colors will blend well with a variety of wall colors and accessories. Quilt is lightweight and made well. Gives the room some life! This quilt matches just about everything. "When choosing "Options", they say the Queen is purple and the King is pink. What does that mean?" "Is it possible to buy an extra pillow sham as well as the throw pillows pictured with it"
At this time the pillows are only sold with the comforter set, however we will have them in spring. The shams are old sold as a set. Looking for a colorful quilt for spring/summer. The unique quilt stitch stood out. "What are the dimensions of the king size? "